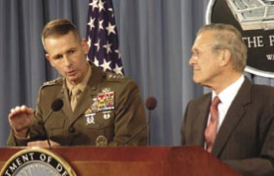 General Peter Pace was sworn in as the 16th chairman of the Joint Chiefs of Staff on September 30, 2005. In this capacity, he served as the principal military advisor to the president, the secretary of defense, the National Security Council, and the Homeland Security Council. Prior to becoming chairman, he served as vice chairman of the Joint Chiefs of Staff from October 1, 2001, to August 12, 2005. General Pace is the first Marine to serve in either of these positions. On April 3, 2008, Behrman Capital announced that Pace had joined the firm as an operating partner and been named chairman of the board of Behrman portfolio company Pelican Products. 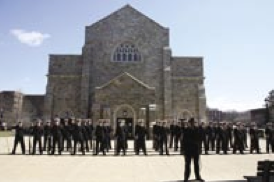 Pace is a 1967 graduate of the United States Naval Academy. He holds a master’s degree in business administration from George Washington University, and he attended Harvard University for the Senior Executives in National and International Security program. He is also a graduate of the Infantry Officers’ Advanced Course at Fort Benning, Ga.; the Marine Corps Command and Staff College, in Quantico, Va.; and the National War College, at Ft. McNair, Washington, D.C.
Pace has held command at virtually every level, and served overseas in Nam Phong, Thailand; Seoul, Korea; and Yokota, Japan. 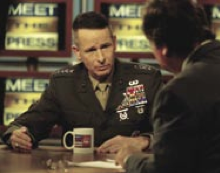 While serving as president, Marine Corps University, then-Brigadier General Pace also served as deputy commander, Marine Forces, Somalia, from December 1992 to February 1993, and as the deputy commander, Joint Task Force-Somalia from October 1993 to March 1994. He was promoted to general and assumed duties as the commander in chief, United States Southern Command in September 2000. As the vice chairman from October 2001 to August 2005, Pace served as the chairman of the Joint Requirements Oversight Council, vice chairman of the Defense Acquisition Board, and as a member of the National Security Council Deputies Committee, and the Nuclear Weapons Council. In addition, he acted for the chairman in all aspects of the Planning, Programming, and Budgeting System, including participation in the Defense Resources Board. Pace has been awarded distinguished service medals from all branches of the military. In June 2008, he was awarded the Presidential Medal of Freedom, the nation’s highest civilian award. He is currently serving on the board of directors of several corporate entities involved in management consulting, private equity, and IT security. He serves on the president’s Intelligence Advisory Board, and the secretary of defense’s Defense Policy Board. He is a long-standing member of the board of directors for the Marine Corps Law Enforcement Foundation — a charity that provides scholarship bonds to children of Marines or federal law enforcement personnel who were killed while serving our country at home or abroad. Ethix: I would like to start our discussion with some questions on the role of the military and its relationship with the global economy. Then we will look at other questions around leadership, ethics, and globalization. At the end, I would like to ask you a few personal questions. So let me start by asking whether you think war is the best way to fight terrorism. General Peter Pace: A military solution is the worst solution to terror. What the military can do for you is to eliminate terrorists, and that is good to a point. But it does not prevent the creation of more terrorists and may actually encourage it. The creation of more terrorists is prevented by good governance and good economics. A military solution is the worst solution to terror. Here in New York, the police play the role of keeping crime below the level at which normal citizens can live their lives the way they want to. That’s what the military needs to do. There is going to be terrorism. The militaries of the world, and the police forces of the world, can help keep that below a certain level, but they can’t provide good governance and economics if they don’t know how and if they don’t have the resources. Right now, we have the capacity to quickly apply military power, and we don’t have the mechanism to quickly apply other elements of the solution. If we don’t develop the other elements, we are going to have this problem for longer than we need to. So, it’s not the responsibility of the military to address issues of infrastructure, good governance, education, and the like? It’s not the responsibility of the military, but it becomes the responsibility of the military by default. When you take an 800-person battalion into a city and the water is not working, there is nobody around except the U.S. military to try and fix the water system. These people are not water engineers, but there is no one else. There are similar issues with electricity, education, and other infrastructure areas. We need a capacity to deploy folks wearing civilian clothes who are experts in how to manage water works, run electricity, build roads, etc., in a way that helps those countries buy for their citizens a better tomorrow than they have today. How much better it would be for our nation to see a country that is headed in the wrong direction, and to be able to send engineers, school teachers, and mayors of towns. These people could mentor and help that country’s central and local governments, provide the kind of governance and economics to help prevent that country from continuing down a bad path. If we had that capacity as a nation, we could prevent the use of military force in the first place. We see “terrorists” who have no economic viability. Somebody offers them $100 and asks them to put a bomb on the side of road, and they would do it, not because they’re ideologically attached to it, but because they’ve got a family to feed. So, there is a lot of opportunity out there to come up with a civil corps, whatever you call it. They could have a reserve status and would be available to deploy for six months at a time in focus groups and go help country A, country B, and country C, before you have to go and send thousands of troops to turn the whole country around. Secretary Condoleezza Rice has had some very good thoughts on this. It seems you have chosen your words very carefully, as if you have thought about this already. Don’t we have such an organization in the Peace Corps? Yes, there is a Peace Corps, but it has very limited scope. We need more than that in my opinion. I had a very interesting conversation on this subject with one of the judges of the U.S. Supreme Court. I asked him what he thought about the concept of a universal draft for two years of country service. You could select military service, or from a long laundry list of things, but there is an expectation that you spend two years of your life serving the country in a way that you chose. He thought that was a terrible idea because he said nations have the right to raise armies and navies to defend themselves, but nobody owes the nation anything. From his perspective, it was not an American ideal to have universal service for the country. I am not part of the left or the right, but I do believe that it would be very useful to have a national dialogue on how best to help other countries by sending something other than the military to those countries. For some places in the Middle East, Afghanistan, or sub-Saharan Africa, their greatest export is angry young men who have no means to support themselves. It sounds to me that this is yet one more dimension of globalization that we are experiencing. True. But remember, there is a kind of counterpoint to what I have been saying. Osama bin Laden was a multimillionaire, so it’s not just the downtrodden who are the problem. However, it is those in the lower economic structures who are more susceptible to leadership in that direction. Your question does suggest another challenge we face in military efforts with our allies. We do need to have a dialogue about our differing views on terrorism. We have 26 NATO nations in Afghanistan and many have differing views on why they are there. Four or five countries believe that terrorism is a threat to their survival, while others are there because they believe it is a nice thing to do for Afghanistan. Those on the ground know a lot more about the details of what is going on than any senior officer. This creates a challenge for the NATO commander in Afghanistan. Everybody will follow the orders of what to do, but when it gets to the shooting part and people are about to die, those who are there believing that they are protecting their own country, in addition to helping Afghanistan, will react differently from those who think that they are donating to the good work. Neither is right or wrong, but we need to find a common ground. As a person on the outside, knowing nothing, I had been led to believe that the Iraqi War would be an easy thing. “Shock and awe” was the term used to describe it going in. It was supposed to be so much different than Vietnam, where we got stuck and couldn’t get out. What happened? Inside the Department of Defense, there was a great deal of dialogue involving the senior military and civilian leadership, about how long this might take. We identified 20 to 25 things that could go wrong before we even started, and we briefed the president on all of this. So, we were trying to think of all the things that might go wrong, with certain knowledge that any time we are going into a conflict it has to be [at least a 10-year] proposition because of the challenge of removing the old guys and bringing in the new guys. When you take over a country militarily, you buy responsibilities to its people. Why did we go to Iraq in the first place? I was the vice chairman of the Joint Chiefs of Staff at the time of the decision. First of all, I believed that Iraq had at least chemical weapons in the war zone, based on everything I read on the intelligence reports. I believed it, everybody I knew in the military at the time believed it. We outfitted our troops so that when they went closer to Baghdad they would all be wearing protective gear against chemical weapons. In retrospect, we were wrong. But given the exact same data that I was given back then, I would come to the same conclusion. Second, I believed, based on the intelligence data that we had, that Iraqi division commanders, once we invaded, would surrender their entire division to us and fight on our side. Therefore we would have the 400,000-person Iraqi army quickly available to us to support the new Iraqi government. Instead, it disintegrated. Again, our intelligence turned out to be wrong. Third, we believed that the Iraqi people, having thrown off Saddam Hussein, would welcome us at least initially with open arms, and that did not happen. I did not foresee the hatred among Sunni and Shiites playing out the way that it has played out. The tide is turning on that, because they are getting tired of killing each other and starting to see that they should love their kids more than they hate each other. But for a period of time, we did not have the welcome we had been led to believe we would have. I have gone back multiple times and looked at each area in which our estimate was wrong. What was it that we should have known differently? From the standpoint of what we knew, the facts that we had before us, the decisions at the time made sense. Given the exact same data, I’d make the exact same recommendations again, even though in retrospect, we were wrong. Have you thought about how our intelligence data could have been so wrong? I have thought a great deal about that question. But that is really a question for the people at intelligence. Does the private sector have a role to play in a place like Afghanistan or Iraq? Are there opportunities that businesses would find attractive, meeting their own objectives? There are great business opportunities inside of the secure zone. It is important that the military has an opportunity for creating that secure zone, but inside it is an opportunity for business, especially in Iraq, which is a rich country in both natural resources and education. Afghanistan, on the other hand, is a poor country in these areas, and it is important to understand the difference. If both countries would decide tonight that they wanted to focus on economic development, in Iraq you could get to your goal much faster than in Afghanistan. 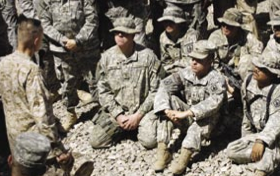 My picture of leadership in the military is that it is very “top down.” Yet much of the business world is recognizing the need for involvement from everybody. Do I have the wrong impression of military leadership? I think your premise is wrong. In the military, the highest level strategy comes top down, as it does in most businesses. But once a direction is identified, leadership to carry out this strategy is top down, bottom up, and sideways. Once the chain of command issues an order of intent, the folks at the lower levels use their own initiative and leadership in carrying this out. I think leadership “up” is at least as important as leadership “down” in the military. As a senior leader, how do you engage those in your command? I like to listen as much as I can. When I come into a new organization, I spend as much time as I can just talking to folks about what’s going right and what’s going wrong. Inside the military, there is always a senior enlisted person who you can talk with to find out their perspective and get their guidance on whatever is happening. I gather senior leaders’ perspectives. Then I can put together my own thoughts of what I heard and make decisions. When we get together I tell people what I understand, where we’re going to go, and how we can get there. But I always use examples of who told me what so that they know that I have been listening and paying attention. Those on the ground know a lot more about the details of what is going on than any senior officer, and I would be a fool not to gain from this knowledge. How good a leader do you need to be? Probably better than your boss thinks you need to be, and not quite as good as you think you need to be. Most people are pretty tough on themselves. You don’t have to be really good. You have to continue to be a student of your environment and your responsibilities. You have to continue to listen. I am not the world’s smartest guy, nor am I the world’s dumbest guy, but by caring for the people in my charge and listening to them, making sure they understood what my intent was, the units I was privileged to be a part of always performed better than the guidance I gave them. They understood that I did care about them, they understood what I really meant to say, and they executed at a level that I was not smart enough to direct them to. So I think it is good to feel very humble at every level of responsibility, to feel lucky to be the leader at that level, to understand that you probably don’t deserve it, and the folks that look to you for leadership probably deserve a better leader than you happen to be. But by working as hard as you can to understand, to learn, and to care for your people, you earn the capacity to be the kind of leader your people really deserve. In the military, how do you balance the needs of the individual vs. the needs of the organization? And how might this apply to a business? Being a Marine, and always having mission first, normally we aspire to have individuals become subordinate to the organization and do the mission without regard to impact on the individual. That’s an oversimplification. But my mental attitude going into the question is 40 years in the Marines, driving to success, while taking care of subordinates. Having said that, everything is not life and death. As a leader, when you become aware of conflict between where you are going and subordinates needs and rights, it is incumbent on you to make a conscious decision — not always for the company and not always for the individual. These are the tough ones where I would try to put myself in my place, my boss’ place, and my subordinate’s place and try to figure out what best to do. But I admit I have rarely encountered this position. Perhaps one reason why you have not encountered this is something you told us earlier in the day. Rather than sitting in your office and shooting out directives, you would be out with the people trying to listen and learn things from their perspective. Perhaps knowing this perspective is a reason you have not often encountered the problem. That’s a good point. If, in fact, you are a leader who is out and about, managing by walking around, you will learn things that you cannot learn any other way. When you are in a leadership position, you will get a little problem brought to your attention. Once you show people that you really do care about them and are trying to do the best that you can, you will start getting a flood of information. So if you are out understanding how people are thinking, you will already know how decisions will affect individuals, and you have probably already factored that in. How did you say “no” to a boss? How do you confront a boss who asks you to do something that you don’t think is right? When disagreeing with a boss, I will start by asking questions because this allows you to put a different idea on the table without being directly confrontational. Didn’t you have a confrontation with Secretary Rumsfeld on television that was more direct than this? Wasn’t it over the use of torture at Guantanamo Bay? Yes. To be clear, Secretary Rumsfeld did not give a green light to torturing people at Guantanamo. We spent months with lawyers and judges talking through what we would and would not allow our people to do while interrogating detainees. I was comfortable that the decisions we came up with and the guidance we gave was very much inside the boundaries of what I was personally comfortable with. This does not mean somebody did not break those rules. But I was very comfortable with the rules. That’s an example of having your moral compass set going in. Press conferences were not my favorite sport. But my mental outlook going in was I was never going to leave a misstatement uncorrected, whether it came from my side or the other side of the microphone. I thought it was important to be very precise on international TV since millions were watching, and there wasn’t time for a dialogue between us to gain understanding, which we eventually did. So, I was sad that it ended up being a difference of opinion in public, but I would have been sadder had I not spoken up. Have you had mentors in your life? At every level. That is one of the things I value from my military background. In addition to serving the country at a time of great need, you are immersed in a time of great learning and mentorship. In my first assignment in Vietnam, I was a lieutenant and my leader was a lieutenant colonel. When he retired as a three star general, I was a colonel. During that entire 24-year period, he always watched out over me. That was true of many, many people for whom I worked, and who watched out for me and did things that I didn’t even know about. As a leader, I would turn and do the same thing for my subordinates. Mentoring is a wonderful thing. When you find a good mentor, stay with him or her as long as that association can last. And realize that you, too, are a mentor. The more senior you get and the more capacity you have to help, the more experience you have to offer as a mentor. There is always someone in your orbit that you can be a mentor to. You have been involved in leading a very large organization. And while you may have a strong personal commitment to ethics, how do you get that ethics to reach down into the far corners of the organization that you don’t touch every day? In the case of ethics, how you live by example is going to be the most fundamental thing you do. But also as a leader, it is extremely helpful to tell your subordinates exactly what you expect from them ethically. You need to do this in such a way that is not pontificating, but gets the point across clearly. The instant that one of your subordinates challenges you in public about some ethical issue is the instant you should praise that person as publicly as you can for having the temerity to do just that. If you think they are wrong, explain why, but still thank them for doing exactly what you hope everybody in the organization will do. So the more senior you are, the more responsibility you have to create the environment to elicit from people, and to praise in public, those who would help you stay the course. When they know you are serious about ethics yourself, they in turn will take ethics more seriously. One of the tests of leadership comes when things go wrong. I am sure you have dealt with problems in your role as a leader. Can you give an illustration of what you did to try to reestablish the integrity of the environment? There was an event in Vietnam where I almost made a very serious mistake. We had been on a patrol, and a young Marine named Lance Corporal Guido Farinaro, 19 years old, from Bethpage, New York, was killed by a sniper. The bullet came from a nearby village. I was the platoon leader, and he was my machinegun squad leader. I was enraged, and I called in an artillery strike to get the sniper. Then I looked to my right and saw 21-year-old Sergeant Reid B. Zachary. He did not say a thing, but he simply looked at me, and I knew what I was about to do was wrong. I called off the artillery strike and we swept the village, as I should have done in the first place. We found nothing but women and children, as the sniper was long gone. I don’t know that I could have lived with myself had I done what I originally planned to do. I don’t think I would be standing in front of you today. I had almost allowed the rage of the moment to overcome what I thought was some substantial thinking about who I was going to be in combat. After the event, I called my platoon together in a little bombed out crater, and I apologized to them. I told them had it not been for Sergeant Zachary, I probably would not have made the right decision. The reaction of the platoon was amazing. It was a very warm, family response, and I learned that a leader admitting mistakes, and thanking those who point them out to him or her, is really important. Erisman: Did this affect your decision-making process? Yes. I have found that you should never let anybody rush you in making that decision. The more important, the more you should think. But equally important is to take a look at the decision from other people’s perspectives. Ask yourself, what would my boss expect me to do? What would my peers expect me to do? What would my subordinates expect me to do? If you can get outside your own body, and look back on yourself from various viewpoints, you can help yourself see a path ahead. Then, at the end of the day you go with the thing you are most comfortable with, not necessarily with what any of them thinks. What is your take on what happened at Abu Ghraib in 2004, where American soldiers were accused of serious atrocities? How did that play out in terms of your leadership to see a situation like that happen way down in the organization? It was devastating. Despite all the hard work of millions of individuals that was positive and good and properly focused, relatively few did enormous harm to the credibility of the United States and the U.S. armed forces. It was, in fact, a disaster. Take a look at the decision from other people’s perspectives. I have to be careful here, because some from that tragedy are still in the legal system. The good news is that the problem was surfaced by somebody in the military, somebody who saw it going on, knew it was wrong, and reported it, which led to the investigation and the final determination of what happened. There is a very disciplined system inside the military for finding out what happened and taking each of the individual processes that needed to be fixed and fixing them. We had a team led by a senior general that was responsible for reporting back, and they developed a matrix of the process issues requiring changes that are now being implemented. There were between 400 and 500 specific changes that needed to be made, based on the four and five investigations that we did. How do you find your own ethical compass? I think an ethical compass is very personal. I think it is the totality of your experience. If you don’t have the personal experience in a particular area, you should watch those you admire and emulate them. You may find, as you try to emulate someone, that you are not comfortable in that emulation. If you are not, stop. Everybody is different, and some can carry the day in a particular way and other people can’t. There is a little voice inside that calls us to attention. I think that’s where your moral compass comes from. It is the voice inside that reminds you all you have learned, and that sometimes you wish would just leave you alone. The more you wish it would leave you alone, the more you ought to be listening. How do you think about making ethical decisions? We must realize that we will all encounter the grey areas, and the problem here is that we can get comfortable giving ourselves the benefit of the doubt here. Because it’s grey, we may, especially if we have been making some pretty good decisions, get sloppy here. I can’t tell you when you are in the grey zone. Only you will know that. And it doesn’t really make a difference if you are in the grey zone. Only you can hold yourself accountable for your ethics. Make sure of your own moral compass. I went to National Security Council meetings three times a week with the president of the United States. I knew what the topic was going to be. I would think through while I was shaving that morning the things I would allow myself to say yes to, and things I knew I would say no to, and the things I needed to make sure I got across in that meeting. I was not always right, but I always spoke my mind. My truth was a piece of the whole truth that everybody needed to look at, along with the other viewpoints in the room. But at least I knew going in, generically, who I wanted to be coming out. I told myself if I heard anything in there that I was not comfortable with, I was going to speak up, and for sure I was going to say these things. That strategy enabled me to be forearmed for the unexpected things that would inevitably come up in such a meeting. What that resulted in, which may or may not give you any comfort, is that I was then asked to speak my mind about things that had nothing to do with the military. I was viewed, not only as a senior military guy, but as a citizen of the United States, who would be impacted by whatever decision was made by the secretary of the treasury, or the secretary of the state, or whoever was talking. I was welcomed and encouraged to speak my mind outside my lines of responsibility because people knew, even though I was not always right, that I would always speak my mind. Ethics are the norms of right and wrong in a particular culture. In a global setting, how do you choose between the ethics of your culture, and those of the culture where you may be a guest? I don’t know that you need to choose ethically. I certainly think you need to understand the cultural differences. I will use myself as an example. I understand that my ethical and moral upbringing is different than other people’s. But the only ethics and morals that I have are the ones that I have — and have had engrained in me since I was a child, through my parents, my church, and my mentors. It does not bother me that another person would have a different ethical view. It does bother me that other people would deny me my opportunity to have my view. I would think that as a country would look at their senior military leader, they would find some comfort in knowing that that person had an ethical, moral basis even if they don’t agree with all of the basis of that ethical framework. The individual needs to understand that that is his or her moral upbringing, that there are other cultures and countries, other religions, other views on a particular topic. Just like I talked about the “truth as I know it,” so I need to understand that my view is the truth based on my upbringing. So I should certainly put it on the table, but I should understand that it is not inviolate. Ethically it is inviolate for me. But you ought to understand that others may not see it the same way. Even in other cultures, if you have taken time to go visit the museum and they know it, if you have taken time to get to know their country and they know it, they are more likely to appreciate your culture and your ethical background and work with you because they know you are not trying to jam something down their throat. That said, I have found a significant commonality between ethical views by people from different cultures. Yes, there are differences, but I have found much more commonality than differences. If you act ethically so that you can sleep at night, aren’t you really doing this for selfish purposes rather than in consideration of others? The more moral and ethical challenges I have had, the less sleep I have gotten. I don’t want to be rushed in dealing with a tough ethical situation, and especially because every person has a different upbringing. It is really important to think through what decisions you are going to make and how you are going to communicate these decisions. So I would tell you someone who is living a highly ethical life is probably getting less sleep when the challenges come up. It requires an enormous amount of mental energy to get comfortable inside your own skin. You need to understand you will take hits, and you have to go ahead anyway. I have been fortunate to visit over 100 countries around the world, and to live in several of them. What strikes me is both the similarities and the differences. One way to get to know a country quickly is to spend a half-day in their museum of history. You will quickly see what it is that has shaped that country, and you will start to understand why certain things mean what they do in that country. Countries that win all their battles think one way, countries that lose all their battles think another way. It allows you to understand the culture in which you are operating. I do believe there is a responsibility from those who have more capacity to reach out to those who have less capacity. I don’t mean to be a “pollyanish” do-gooder and give away all the tax payers’ money. What I mean is, there is a balance for any country between how much you spend at home and how much you spend overseas. Just like individuals, countries are accountable in the end for their actions. At the end of a lifetime for an individual, and at the end of a period of time for a company or organization, there should be an assessment of who you want to be and what you stand for. There is a responsibility from those who have more capacity to reach out to those who have less capacity. I know that the United States is a good country with a good heart. We don’t get it right all the time, but we do try to reach out to those who are less fortunate. The leaders of the future will be the individuals who determine what our country does next. I would commend to you in your personal lives as well, share with those less fortunate than you. So also in your professional life, find a way to move your company and your country to share with others. Despite the global economy, do Americans have an obligation to try to keep jobs in our country? On a yes-and-no basis, my answer would be no. American business has a responsibility to be competitive and to be as good as we can be on this lily pad, and then to go to the next lily pad before anyone else does when we can no longer be competitive on the previous one. That means we always need strong leadership. It also requires always being in the lead, always working hard. You protect jobs in the country not by putting up fences, but by leading and thinking, taking everybody to the next lily pad. Don’t try to defend car making in the U.S. just because it provides a certain number of jobs for Americans we have to protect. In this case, the question would be how do we provide the best car, not how can we protect the jobs. Or how do we replace the world’s best gas car with the world’s best hybrid, with the world’s best electric car, or whatever. You protect jobs in the country not by putting up fences, but by leading and thinking, taking everybody to the next lily pad. So defending for the sake of jobs, no. Accepting the responsibility as a leader to provide a product that continues to provide jobs, that is the right focus in my mind. In the global economy, the more protection there is, the fewer jobs there will be. There would be a downward spiral. You have said you believe in telling the truth as you know it. Could you share a little bit about that? You should always tell the truth as you know it, and you should understand that there is a whole lot that you don’t know. We know what’s going on in this room right now. When this is all over, the three of us will walk out of here, and somebody will ask you what happened, and the three of us will have a little different version, even though we all had the exact same conversation. So it is important to have some humility when you are speaking the truth. I have to understand that it is my absolute responsibility to speak the truth as I know it. I don’t know everything, but the truth I know is this: You should understand that somebody else’s truth may flesh out your truth in a way that is different than you currently understand the truth to be. I know you have loved the military. You are now considering business options. How are you going about this? It’s very interesting and enjoyable. Because I have 40 years of experience, I want to do my homework, to get educated. In the process, I have learned a lot about myself. I want to be doing good for the country by doing good for business. I thought that I wanted to sit on boards of corporations, and I still do. But after Sarbanes-Oxley, you are often prevented from rolling up your sleeves, really supporting the CEO. So, this has led me more toward taking a senior leadership position at a company or being a senior consultant so I could be part of the solution for that company. It has given me conviction that the processes that I have been doing as vice chairman and chairman are very applicable to the current environment in business. What I hope to do is help companies that want to understand what the challenges are 10 years from now. I want to help a company “see around the corner” and be prepared with products and services for the future. Most importantly, I want to be doing good for the country by doing good business. And what does a company look like that you do not want to work with? It takes about 30 minutes with the CEO and president of the company for me to know if I want to have anything to do with the company. It goes very much to what are they looking at doing. Are they looking to build the best business, are they looking to build the best product, and as a result of this to be prosperous, or are they focusing first on just trying to make money? It is very obvious at the level of people I am talking with what the focus is. And it is very easy for me to walk away from certain types of companies. general peter pace is a great person.i agree with his opinion so much. A military solution is the worst solution to terror. One of the finest interviews that spans across a whole lot of things that troubles us even now.